Back in April I made a short trek around countries in Europe which, for some reason, I’d never visited. OK some of them I had visited, but that was way back in the 1970s, before they even existed, back when two of them were constituent parts of Yugoslavia. That trip took me to Bratislava in Slovakia, Skopje in Macedonia (soon to be known as the Republic of North Macedonia. Perhaps) and to Pristina in Kosovo. In July I made another European circuit picking up two more countries I’d never visited – blogs on Moldova and Belarus will follow shortly. And one ‘country’ I’d never even thought about: Transnistria – aka Transdniester – aka the Pridnestrovian Moldavian Republic. When the Soviet Union broke up Moldova was one of the former Soviet republics which decided to go off on its own. Except the good people of Transnistria decided they didn’t want to join them. Skirmishes broke out in 1990 and in March 1992 it became a full scale civil war. By July 1992 it was all over – the Russians had come in on the Transnistrian’s side, the Moldovans had given up and Transnistria was effectively its own little nation. 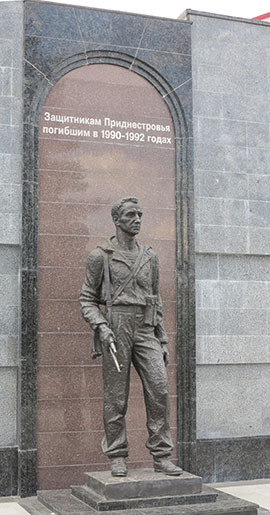 ◄ In the capital Tiraspol’s War Memorial there’s a memorial to the 1990-1992 struggle with Moldova. 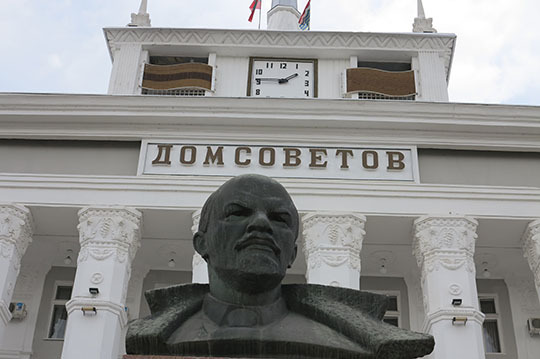 ▲ So Tiraspol today is a little enclave of old Soviet Russia, as the bust of Lenin fronting the House of Soviets, the city’s Town Hall, illustrates. There’s a big Lenin state standing proudly in front of the Parliament building and a third Lenin statue hidden away in the garden behind the National History Museum. Today the half a million citizens of Transnistria occupy a 4163 square km sliver of land between the east bank of the Dniester River and the border with Ukraine to the east. Peace is kept by the Russians, who have to get to the country via Moldova (the Ukrainians don’t want them traipsing through their country). Transnistria has its own currency, its own border controls, its own flag and government. What it doesn’t have is much recognition, apart from Russia the only ‘countries’ which recognize it are other post-Soviet breakaways. It also doesn’t have credit cards, bring cash, your Visa or Mastercard is not going to work. A visit to this possibly non-existent country is an opportunity to experience a reminder of the old USSR. From Moldova the border formalities only take a couple of minutes although you only get a 24 hour ‘visa.’ Mine indicated that I had to exit the country by 1144 am the next day! Supposedly it can be extended quite easily. Crossing out of Transnistria into Ukraine wasn’t so easy, the Ukraine border officials were absurdly slow and the border itself is a disgusting pigpen. Apart from the Lenin statues there’s the Bendery Fortress – the country’s number one attraction? – an equestrian statue of the city’s founder Alexander Suvorov and a riverside ‘beach’ on the banks of the Dniester River. Everybody is friendly – particularly Natalia Filimonova and the other staff at the tourist office. The Hotel Russia was modern and comfortable and Kumanyok (or Kymahëk), with its ‘kitsch faux-countryside home’ décor and ‘fleet of peasant-dressed waitresses’ according to the Lonely Planet guidebook, had wonderful food and good beer. In fact the only thing Transnistria seemed to be missing was the unfriendly officials and greedy authorities which we were repeatedly warned about. We were cautioned regularly and at length how we should trust nobody, obey the rules scrupulously (ie only cross the road on pedestrian crossings) and be ready to get mugged by officialdom at any moment. It never happened. 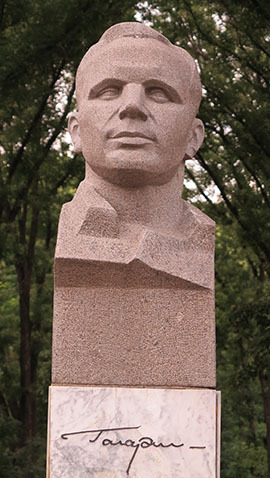 ◄ You couldn’t find a more Soviet hero than cosmonaut Yuri Gagarin and sure enough he also features in Tiraspol.